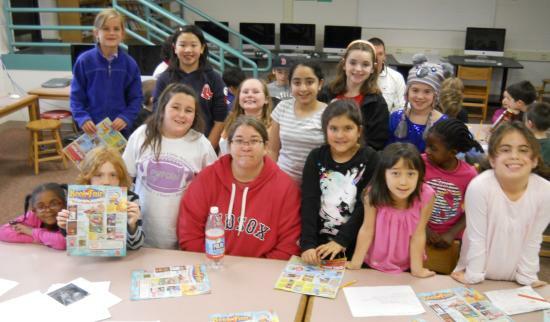 Cunniff parent Maura Gallagher (front row in Red Sox sweatshirt) poses with reporters in the newsroom of the Cunniff Kids News while promoting the Nov. 26-30 Scholastic Book Fair in the cafetorium. CHIPEGO N., NINA P., ANDREA P., IRIS E., ANNA M., ANNALEA M., CHARLOTTE D., SARAH M., KIMORA Y., and KAIA B. Filed under Front Page News, Read All About It! Do you want to start your holiday shopping? 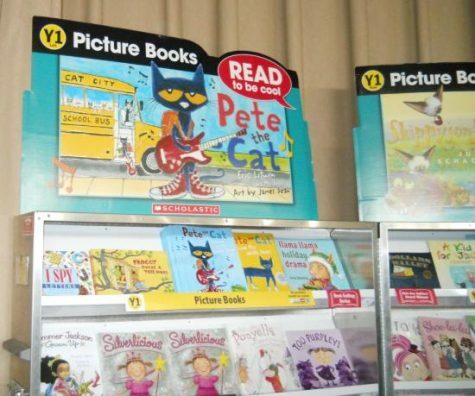 The Scholastic Book Fair will be held at the Cunniff School this week, Nov. 26-Nov. 30, on stage in the cafetorium. Everyone is welcome to come. The book fair will be open each day before school from 7:45 a.m. to 8:15 a.m., and after school from 2:30 p.m. to 3:15 p.m. There will be extended hours Wednesday, Nov. 28, from 4:30 p.m. to 6 p.m. Display cases for the Scholastic Book Fair sit on the Cunniff Elementary School stage during set up. The book fair will be held Nov. 26-30 before and after school. “The book fair raises money for the school to buy new books for the classrooms and the library in the Cunniff,’’ said Maura Gallagher, a Cunniff parent who is helping to organize the event. The most popular books at the book fair are the “Diary of a Wimpy Kid” and “Captain Underpants” series. “My favorite book title is ‘Dog in Charge,’ ” said Mrs. Gallagher. Classroom teachers pick out books and put them on wish lists, so students and parents can buy books for the classroom. Holiday books are available, too. Most of the books are about $5. Hardcover books are more expensive than paperbacks. There is fun stuff for sale, too, likes pencils, erasers, and posters. You can buy something for as little as 5 cents. There is no reserving books or ordering online, Mrs. Gallagher said. You have to pick them up and take them home when you buy them. 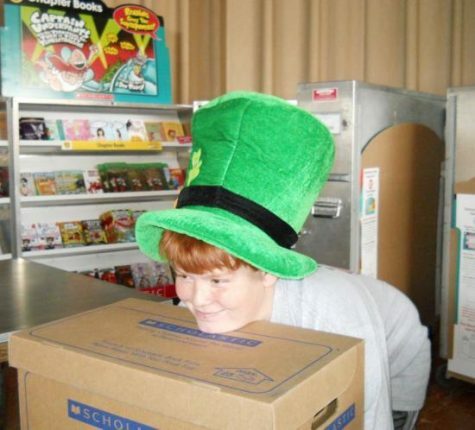 A volunteer helps move boxes for the Scholastic Book Fair at Cunniff Elementary School on Nov. 26-30.